Get to the hard to access fish. So, what, exactly, is a Water Walker? The Water Walker is a lightweight floating platform designed to provide stability and support when you are walking through shallow water with uncertain footing. By grasping its handles as you are positioned in the open part of the Water Walker's "U" shape, you gain stability and can transfer much, if not all, of your weight to your arms, shoulders and the Water Walker. This means you can walk lightly on a mucky bottom without sinking in to your knees. It means that you can avoid tripping over fallen, submerged timber. It also means that you can continue to hunt, even if your legs, knees or hips are injured or otherwise impaired. Place your gun, gear, dog or young hunter on the front and navigate hands free. With the addition of a seat, the Water Walker also becomes a personal raft that can be used as a one-person fishing platform, a diving platform, a super deluxe river raft or whatever your imagination can think up! The Water Walker is 42" wide by 66" long and the base is 7" high with removable handles and gun rack projecting up another 7". It takes 360 pounds to totally submerge and only weighs 35 pounds. It's easy to pick up and carry on your shoulder and fits with room to spare between vehicle wheelwells. 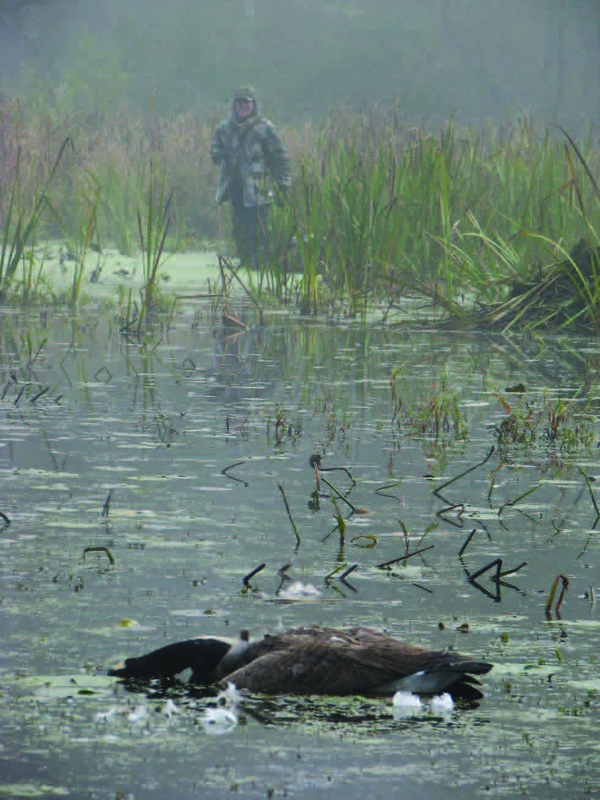 "Even though I am 80 years old, I still enjoy hunting waterfowl with the boys. It just wouldn't be possible without the water walker. I can relax, feel safe and enjoy the hunt." Retail price $399. Flat reduced shipping rate of $50 in continental US. Normally $65 to $190. Call 563-260-4613 with any questions or assistance during checkout. Make a Hard Hunt Easy! The Water Walker makes it easy to get around in any flooded situation. In shallow water, it provides the confidence of sure-footed stability, It can be transformed into an effective blind for duck hunting or photography, and it does it all while making getting around easier, less tiring and much more fun. It provides a stable, dry platform for your gear (or dog), it has a built-in gun rack, and molded receivers for a simple seat or a full range of accessories. 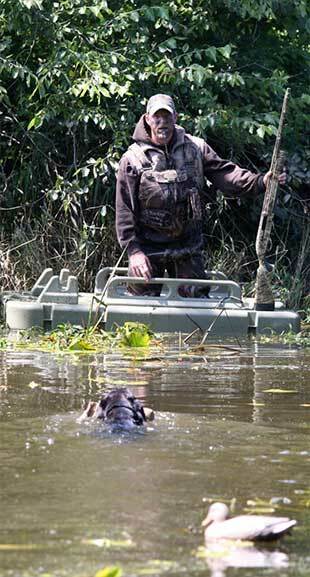 The Water Walker is like having a "Swamp Truck" that makes running trap lines, cleaning duck boxes, frogging and every other shallow water activity easy. It can even be configured as a personal fishing craft that allows you to get into the most remote, overgrown places with ease. It can be invaluable for water (or ice) rescue or flood response, and it can serve as a truly luxurious river raft! Water Walker is light weight and easily maneuvered, so its uses are only limited by your imagination!